You may be asked to pay a $5 operating fee for picking up or dropping off at the airport. If so, send us your receipt and we will reimburse you. Wait in one of the 15 designated parking spots in the cell phone lot pictured above. If the designated spots are full, overflow staging should occur along Airport Terminal Access Road. Only drivers within the designated staging area are added to the queue. Do not wait in parking spots not designated for Lyft drivers. The airport needs to leave spaces open for other patrons to wait for their pickups. Pick up passengers from terminal curbside in front of baggage claim. Do not pick up passengers from the main terminals. Do not wait or circle back at the airport if the passenger is delayed. FLL requires you to leave the airport and kindly ask your passenger to request another ride when he or she is ready. Drop off passengers curbside at Departures at the passenger’s carrier of choice. Do not wait at the airport or accept additional ride requests after drop-off. You must leave airport property immediately after dropping off your passenger. Pick up passengers on the Arrivals level from the Commercial Passenger Vehicle Areas, which are located between the terminals (see image above). Do not wait or circle back at the airport if the passenger is delayed when picking up. Head to the staging area and wait there. Do not wait at the airport terminal after drop-off. Proceed to the staging area instead. Do not wait at the airport terminal after drop-off. If you'd like to wait for request, head to the staging area. Passenger cancellations don't affect your place in line. If your passenger cancels on you, head back to the staging area. As long as you're back within 15 minutes, you'll be placed at the front of the queue. Pick up passengers from the TNC area on the lower level, just past the terminal (pictured above). Pick up passengers from in front of the terminal building. Drop off passengers on the northwest side of the terminal building as depicted above. Beginning in mid-September 2018, Lyft will be testing airport queues separated by ride type at MIA airport. With separated queues, drivers will now have more visibility into what position they are for each mode they are driving for. The staging area will be closed nightly from 1:30am - 3:30am. Please leave the staging lot during this time. Rides will be dispatched by proximity during this time. Do not loiter in the staging lot. Drivers in the staging lot should have their Lyft app on and in the queue. If you do not intend to give rides at the airport, please exit the lot. For a full list of prohibited activity, please see this link. If the staging area is full, you must leave the area. You may not wait for requests anywhere else on property or use any other parking lots while in driver mode. Pick up passengers at their pin location — the app will place the pin in an approved location. Do not pick up passengers at any location other than their dropped pin. Pick up passengers from Arrivals on the center level, just outside the baggage claim on either side of the terminal. Do not wait at the airport terminal after drop-off. If you'd like to accept additional airport requests, proceed to the staging area instead. Pick up passengers from Short Term Parking. Lyft has 2 spaces at the end of the covered walkway. You may way up to 20 minutes in the lot before being charged. Pick up passengers arrivals at the terminal curbside. 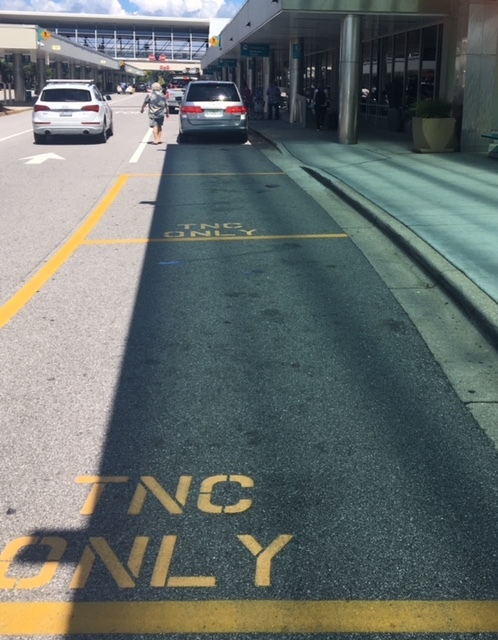 Pick up passengers in the designated "TNC ONLY" spots in front of the covered area, just south of the ticketing/departures curb. Wait in the designated staging area(s). Only drivers within the designated staging areas (pictured above) are added to the queue. Pick up passengers from the Departures level, at the Ground Transportation Area across from the terminal. Pick up passengers from the designated area marked as “Ride Share” on the Baggage Claim level. Do not wait at the airport terminal after drop-off. If you'd like to wait for airport requests, head to the staging area. Beginning 3/11/2018, passengers may request pickups from either the upper or lower levels on both the red and blue sides of the terminal. Please pay extra attention to the pickup location specified in the app. Do not wait at the terminal or circle if your passenger is delayed.